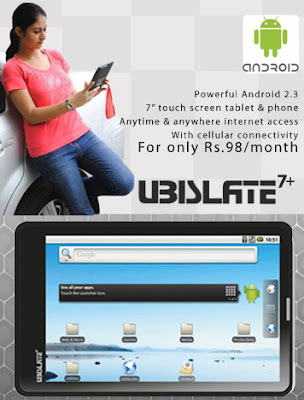 The UbiSlate7+ is an Android 2.3 touch screen tablet that has a HD video co-processor for a high-quality multimedia experience and core graphics accelerator for faster application support. This tablet is the only Android device in the market to offer DataWind’s UbiSurfer browser, based on 18 international patents. The UbiSurfer browser accelerates web pages by factors of 10x to 30x, allowing for a web experience who’s speed is unrivalled. Internet access is available everywhere on a GPRS network at Rs.98/mo. for 2GB. The device includes WiFi & GPRS connectivity allowing anytime & anywhere internet access and phone functionality. Optional 3G modems are also supported via USB. In addition to a micro-SD card slot, a full-sized USB port is integrated into the unit allowing pen-drives, external keyboards, web-cams, dongles and other inexpensive peripherals to be attached. Optional Accessories: Car charger & Keyboard case which cost you extra.